"The names (in the list of farmers whose loans have been waived) have been put up in English and some have even been misspelt. There are many farmers with the same name - they should have included the father's name to make sure"
"They were supposed to put (the list) up on the information board outside the bank. They haven't done that. The watchman says I should check with the babu inside but usually after lunch time they bar entry for us. So how are we supposed to know whether we have been included?" "We look like fools. We should have defaulted. What have honest farmers got in return?" Farmers now resent paying back loans on time; this, bankers feel, will translate to low recovery rates, not so much in commercial banks but the regional rural banks. The scheme waived institutional farm loans worth Rs 60,000 crore. Meant for small and marginal farmers with less than 2 hectares (ha) of land, the waiver was later hiked to Rs 71,680 crore, to benefit almost 4.5 crore farmers. A debt relief scheme of up to 25 per cent, or Rs 20,000 (whichever was more), was also instituted for farmers with land above 2 ha. Their loans were subject to a one time settlement, provided the farmer undertook to pay 75 per cent of the loan in three installments, the first two of which took care of at least one third of this amount. The installment deadlines were set for September 30, 2008; March 31, 2009; and June 30, 2009. The waiver was valid for defaulters unable to pay off loans taken after March 31, 1997. Its cut-off date was initially set for December 2007 but extended to March 2008. Eligibility was also extended to fisherfolk and dairy and poultry farmers. "We look like fools. We should have defaulted. What have honest farmers got in return?" asks an angry Ram Kumar, of Amkhera village in Jalaun district, Uttar Pradesh. Consider also Virendra Khushwaha. He had Rs 65,000 outstanding, but paid up just before the waiver date, March 2008, kicked in. A 1.6 ha landholder, he was eligible for the waiver, but now regrets he took a huge amount from the local money lender to pay up. Specially because he will not be able to pay the money lender back; rain has devastated his mentha crop. As an elderly Jagat Chand Dubey of Garhar village, in the same district, explains, farmers borrow money from the local moneylender and pay back the loan before the due date, to keep their record clean. So, as soon as fresh accounts are opened, they withdraw the amount and pay it to the money lender. In effect, they remain indebted by the same amount to the bank each year. Most farmers in the Bundelkhand region, big or small, have paid up their installments. Now, they can only regret. "Small farmers have smaller loans while large farmers have larger loans. Why should any one be left out, especially those honest enough to pay up? There are many who borrowed money and used it for non-agricultural purposes. They failed to pay back and are now enjoying the waiver," says an angry Bhawar Singh of Rampara village in Lalitpur district, Uttar Pradesh. Robin Roy, associate director of PriceWaterhouse Coopers, which works with commercial banks, feels the loan waiver will vitiate the credit culture and make loan recovery very difficult in the future. A nabard official concurs. The loan recovery rate in the next two years is likely to plummet. The worst affected are likely to be co-operative banks, land development banks and the regional rural banks. Meanwhile, Dubey sums up the general sentiment "This is an example the government has set. Why should we pay up the next time? Some other government will come and waive our loan." Moneylenders' grip is evident tractors loaded with dismantled jaggery making units, being taken to kabadiwalas to be sold at throwaway prices, are a common sight in some parts of Bundelkhand, especially on the way to Hamirpur. Mohammed Mujeeb Hashmi of Nauranga village in Hamirpur district ferries such units every day. It is a regular feature, he says, following drought in the region last year. Chandra Bhan Singh, of the same village, is a sugarcane grower; he says he has sold off his pump set, huge vessels used to making jaggery, cane crusher, and tilling and crushing units. 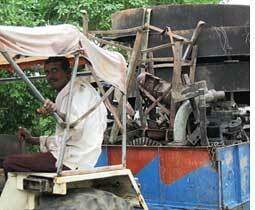 "The crusher cost me almost Rs 30,000 but I am now selling it at nothing more than Rs 6,000-Rs 8,000. I have to pay back the moneylender." His brother, on the other hand, had his loan waived since he was unable to pay. As economist, Parmod Kumar, of the National Council of Applied Economic Research, Delhi, explains, "The share of small and marginal farmers in formal credit is just 25- 30 per cent. For large farmers, on the other hand, though institutional sources are available, their requirements are larger and so they resort to informal sources of credit. Banks, thus, meet only 50-60 per cent of their demands." Private money lenders account for Rs 40,000 crore of the total debt and they usually lend at interest rates greater than 30 per cent. According to the 2007 report of the R Radhakrishna committee, set up to examine all aspects of agricultural indebtedness, only 51.3 per cent of all farmers have access to institutional credit. The committee had suggested to relieve farmers of private debt carrying high interest rates by transferring it to institutional agencies; it had specifically warned against loan waivers. Moreover, the report says the average indebtedness of farmers, with land up to five acres, is only Rs 8,870. Most of this is not under 'crop loan' but for livestock, implements or even marriages. But the government's scheme is only for crop loans. Clearly, the government has ignored its own information. A list of those eligible for waiver was supposed to be put up outside all commercial and co-operative banks by June 30 this year, after including clarifications issued to the banks in the last week of May. When contacted, the State Bank of India (sbi) head office claimed its branches across the country had complied with the June 30 deadline. But several sbi branches in the Bundelkhand region, both in Uttar Pradesh and Madhya Pradesh, had not put up the list till as late as July 14. The Madhya Bharat Grameen Bank too had not put up the list and officials declined to comment. An agricultural development bank in up's Hamirpur district, a wing of the sbi, was forced to put up the list after a local ngo intervened. Farmers are confused. "They were supposed to put up on the information board outside the bank. They haven't done that. The watchman says that I should check with the babu inside but usually after lunch time they bar entry for us. So how are we supposed to know whether we have been included in the list or not?" reveals Tulsi Das Rajput of Bhamaurikhurd village in Mahoba district in Uttar Pradesh. Das is neither a small nor a marginal farmer, but often accompanies them to the bank to check out the names in the list. He informs that Allahabad Bank and Triveni Kshetriya Grameen Bank, too, have not yet put up the list. A K Srivastava, nabard's deputy divisional manager in up's Lalitpur district, however confirms all the branches of the regional rural banks have put up their lists. "New accounts are being opened for those farmers whose loan had been waived and we will begin issuing the certificates regarding the waiver and the relief soon." According to nabard, in Lalitpur alone, loans worth Rs 78 crore have been waived for about 55,000 farmers, of which almost 38,000 were small and marginal farmers. There are other glitches. "The names have been put up in English and some of the names have even been misspelt. There are many farmers with the same name - they should have included the father's name atleast to make sure," points out Gajraj Kushwaha, a farmer in Garhar village in Jalaun district. Others in the village add the account number mentioned in the list is written differently, creating confusion. The rules call for a notified grievances redressal officer in each branch to help the farmers with any queries. And as Srivastava puts it, they are suppose to take the complaints in writing from the farmers and reply to them within 30 days. But the fact is these officers are missing. When Vijay Singh, from Amkhera, went to his branch for some clarifications he was asked to go to register his complaints at the Kanpur office instead of the branch in his village. Because lists haven't been put up, touts (helping illiterate farmers do the bank work) are on a ball. In Bundelkhand unsuspecting farmers have even fallen prey to touts who, on the pretext of getting their names on the list, have demanded money. "Some of the farmers are illiterate and those who are literate do not understand English. These middlemen, who are hand in glove with the bankers, charge up to Rs 1,000 rupees from the farmers to get their names on the list. While, actually, their names have already been included," informed K K Chaturvedi, a social worker at Rath in Hamirpur district. Says Tulsi Das Rajput "The farmers are hopeful of another list." The banks are on their way to begin an audit of the waiver--a process they feel would stretch up to September. The audit would look into the profile of those whose loans have been waived, whether the procedure set by the RBI was followed and if there was anyone who was left out in the process.